When last we visited the new house sprouting at the corner of Linden Lane and Hamilton Ave, it was a hole in the ground, knee deep to a cicada, with one side of the basement pressed up close and personal to the buried portion of Harry's Brook that flows from downtown Princeton to Harrison Street. The owner's profession has to do with "aging in place", and her desire was to build a house particularly well suited to that purpose. 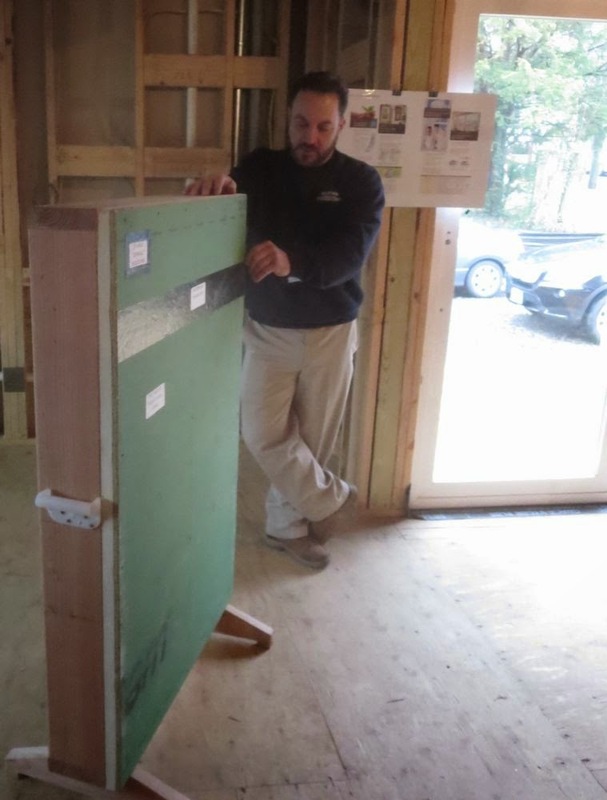 So-called "passive homes" use passive features like abundant insulation, tight construction, and solar heat to combine great comfort with very low utility bills. Now that the house is two stories high, framed in and sheltered from the storms, the architect and builder, David Cohen and Baxter Construction, have been hosting tours for all to see its sustainable features. We started in the basement, which was prefabbed in a factory using custom-sized panels of concrete so dense they didn't need any coating to keep the soil moisture out. 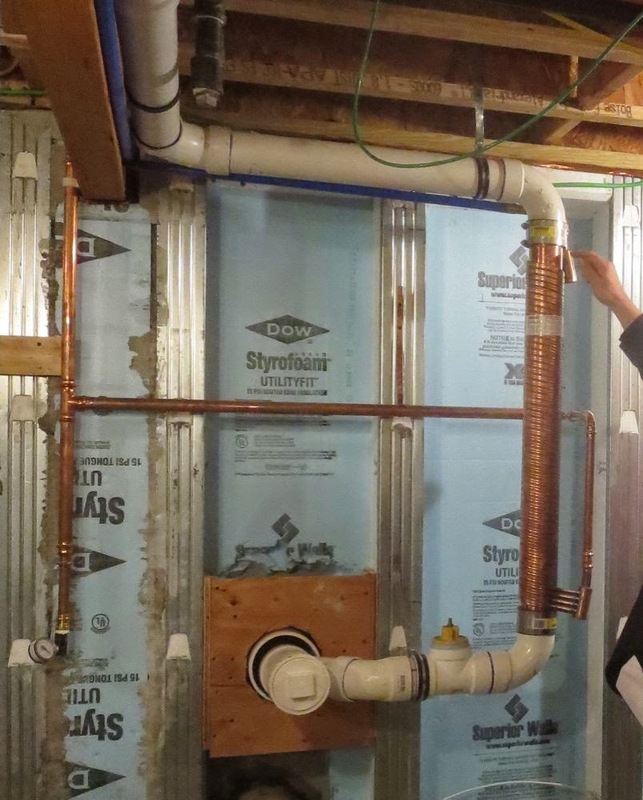 The copper tubing wrapped around the sewer pipe transfers heat from the wastewater leaving the house to the city drinking water entering the house. 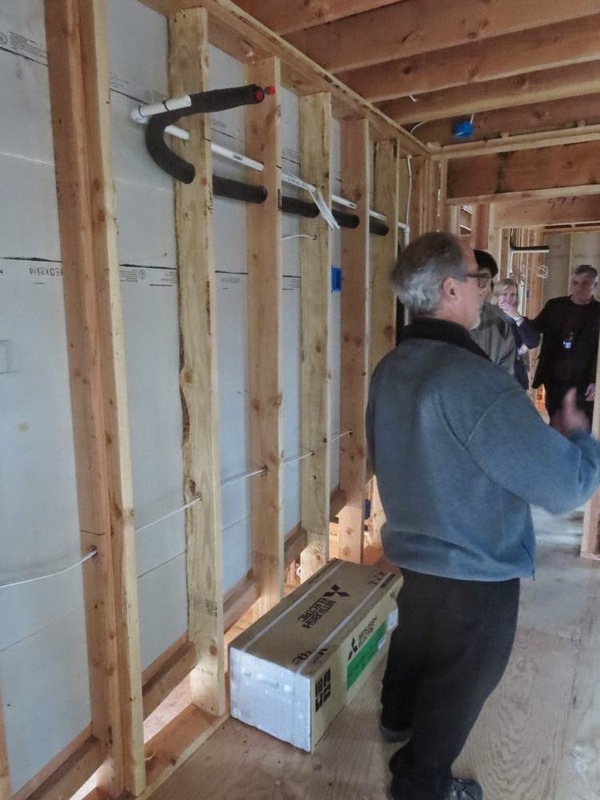 These units, which cost $600 at a bigbox hardware store and can also be installed as a retrofit, raise the temperature of incoming water significantly, reducing the energy needed to make hot water. This nifty panel distributes water to bathrooms and kitchen. There's a direct line--red for hot, blue for cold--going to each room. The lack of branching shortens the distance the water needs to travel, thereby reducing heat loss between the water heater and the faucet or shower. The water heater is "on demand", meaning it doesn't have to expend a lot of energy keeping a big tank of water hot. 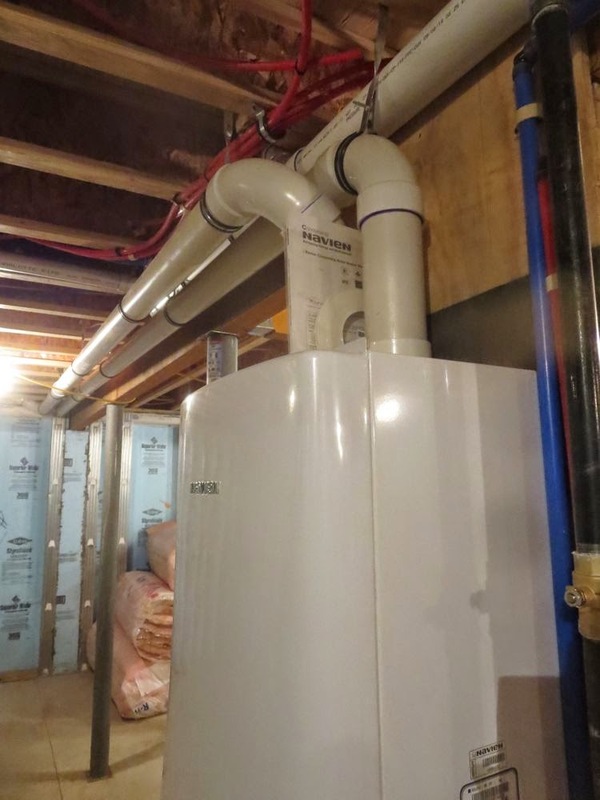 One of the two pipes heading from the water heater to the wall brings in outside air for combustion. Otherwise, the unit would need to use indoor air for combustion, which would mean pulling unconditioned air into the house. Upstairs, the walls are six inches thick, allowing four inches of sprayed foam insulation, leaving room for wires inside the walls. 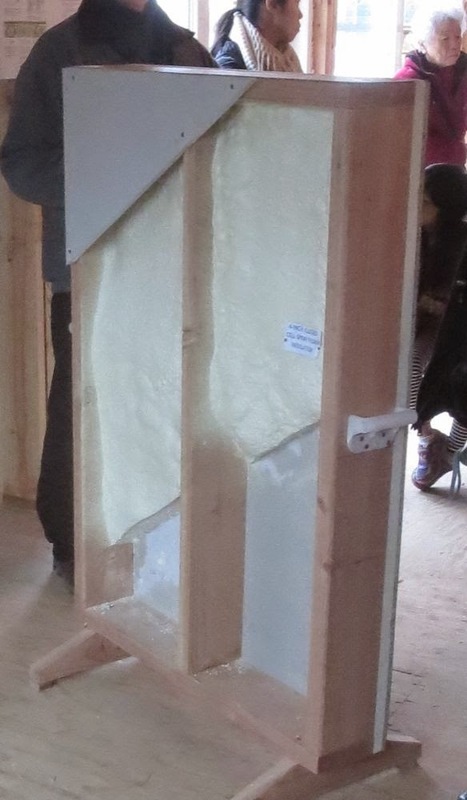 This panel of insulation on the outside prevents unwanted heat transfer into or out of the house through the studs. There's a row of windows facing south that passively harvest solar heat in the winter. An overhang shades the windows in the summer. Standard window glass for houses is treated to reduce the amount of solar heat that can enter. For passive solar, special windows are needed that allow the solar energy through. According to the architect, only one manufacturer in the U.S. supplies this type of window, which speaks to the near complete rejection of this free source of winter energy by the building trade. The house's passive harvesting of solar energy in the winter is one feature of passive homes. There's a great documentary about the passive house concept called Passive Passion that was shown at the 2013 Princeton Environmental Film Festival. Even in our 1960 house, we can enjoy the boost in solar heating provided by the southwest facing windows in the winter. 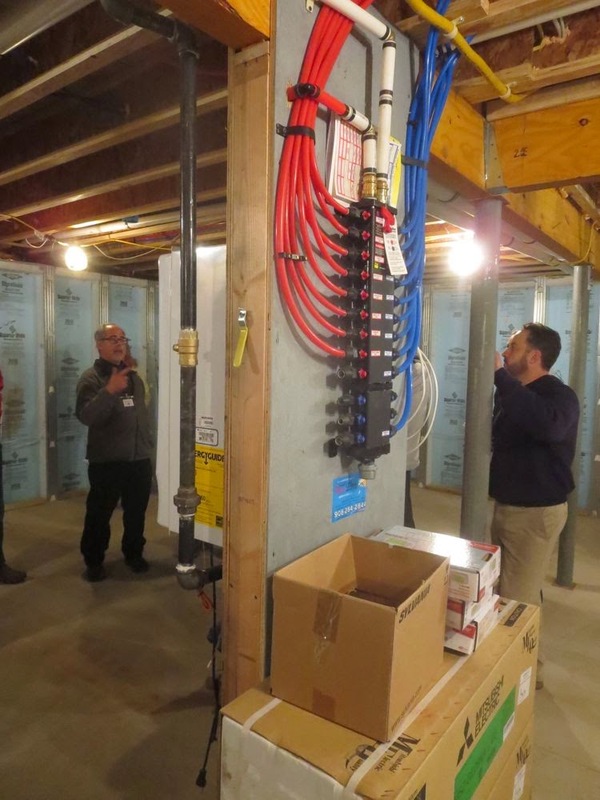 Upstairs, the architect explained that they had considered geothermal heating, but due to the high cost decided instead to install a heat pump. It's like an air conditioner that can function as a heater in the winter. Instead of ducts, the one compressor outside drives three separate units mounted on inside walls, one for each bedroom and one for the great room on the first floor. The indoor unit, in the box on the floor in the photo, will be mounted on the wall where the tubing is. Each unit has its own thermostat. Because the house is so well insulated, even rooms that don't have heating/cooling will remain comfortable. The air-tight construction allows ventilation to be controlled, with much of the energy in the exhaust air transferred to the fresh air coming in from outside. There will be a "green roof" over the porch. Solar panels may be added to the metal portions of the roof in the future, but require a track record of energy use so the system can be properly sized. Metal roofs are more expensive, but last a long, long time and do not emit the volatile organic compounds (VOCs) generated by asphalt shingles. This is a very thoughtfully designed house, combining affordability with longterm thinking that will yield great comfort and savings for as long as the raingarden grows and Harry's Brook flows. Thanks to architect David Cohen and Baxter Construction for a great tour of this impressive new home. How is today going to be different? "Let's get to the end so we can reach the beginning." Below is a PROPOSAL FOR COST-EFFECTIVE COLLECTION OF LEAVES, YARDWASTE AND BRUSH IN PRINCETON, NJ. I submitted this proposal to Princeton council Dec. 15, 2014, with input and support from other town residents who have repeatedly expressed concerns about the existing policies over the years. Thanks to Daniel Harris, Grace Sinden, Bainy Suri, and Pam Machold for their help. The Princeton Environmental Commission (PEC) has also been working very hard on this issue, and submitted a memorandum to town council October 3rd. Our proposal and the PEC's memorandum can be seen as complementary, with the memorandum giving an excellent summary of all the drawbacks of the current system, and our proposal offering a detailed alternative. Princetonians and town staff have strong opinions about yardwaste collection. It is human to immediately seek out flaw in any proposed change to the way we do things. Hopefully, this proposal will be received in the positive, exploratory spirit of "This approach has worked elsewhere. How might we make it work in Princeton?". For readers in a hurry, here is a summary of the proposal: 2-3 months of loose leaf collection in the fall, year-round weekly pickup of containerized yardwaste utilizing 64 or 96 gallon roll carts and yardwaste bags, and 2-3 free special pickups of bulky brush per resident each year. The investment in the new program should get paid back through savings in a year or two, and save hundreds of thousands of dollars yearly from thereon. Any proposal must satisfy the practical needs of residents and the political needs of town council. The goals of the proposal are dramatically reduced cost, improved street safety, adequate service to residents, more utilization of leaves/yardwaste onsite in people's yards, dramatically improved streetscape appearance, reduced water pollution, and improved compliance with state regulations. More efficient collection will allow a shift to other priorities for some employees now constantly chasing after yardwaste. A careful reading of the PEC memorandum will show that it does an excellent job of describing the problem, and encouraging people to use leaves on site, but doesn't address brush as a distinct issue from leaves/yardwaste, and doesn't give a clear sense of how we will shift away from loose leaf pickups. It also doesn't provide council with a way of covering its apparent promise not to reduce overall service. Reduced staff needs for yardwaste collection means freed up staff can perform other functions currently neglected or contracted out. These include better business district maintenance, storm sewer cleaning, better park maintenance, and 60% reduction in road repair costs when done in-house. Reduced wear and tear on equipment, reduced fuel costs. Reduced street-sweeping costs due to less dirt and debris in streets for monthly street-sweeps to deal with. Reduced tipping fees and composting costs as new approach helps residents discover how easy and beneficial it is to compost leaves/yardwaste onsite. Containerized yardwaste collection can bring big savings and stability to Princeton's foodwaste collection. Other municipalities (e.g. Ann Arbor, San Francisco, Seattle, Portland) allow residents to add foodwaste to the large yardwaste rollcart, and co-compost the foodwaste/yardwaste. It's conceivable that, with permitting, the Ecological Center could be used for this sort of composting, greatly reducing fuel and collection costs compared to the current foodwaste collection program. Only through the use of roll carts for yardwaste will this future savings be made possible. This proposal seeks to anticipate all concerns, mixing idealism with pragmatism. It is based on long observation and research of how other municipalities handle the issue. Phone calls to nearby public works departments make clear that Princeton is not alone in its search for a solution. West Windsor, Hopewell, Lawrenceville—all are struggling, just as we are, with dumpings of yardwaste, leaves and brush on the streets that are year-round and fail to adhere to ordinances. This is the only proposal I've seen that takes into account not only leaves/yardwaste but also brush. Also key, while reducing overall cost and limiting some services, this proposal adds a service so that council can claim it is keeping its promise not to reduce overall service. A former high level public works employee estimated the annual current cost of collection to be $800,000, half of which he believed could be saved by changes to the program. Costs likely exceed $1 million when composting costs and all direct and indirect costs are factored in. We are still waiting on better numbers. The inefficiency of the current system is such that an alternative approach would likely save $400,000. The proposed service is so simple it can be described in one sentence: 2-3 months of loose leaf collection in the fall, year-round weekly pickup of containerized yardwaste utilizing 64 or 96 gallon roll carts and yardwaste bags, and 2-3 free special brush pickups per resident each year. The investment in the new program should get paid back through savings in a year or two. · Loose leaf collection during 2-3 months in the fall. Residents can still put loose leaves on the street during that period, but fines will be issued if the leaves are too close to stormdrains or block traffic. The other 9-10 months of the year, loose dumping of leaves/yardwaste is not allowed. For homeowners with large wooded lots, there is no reason to be piling fall leaves next to the street. Some means of strongly encouraging onsite composting should be considered. · Each resident can call in 2-3 times/year for free special pickups of brush. Additional curbside pickups of brush will require payment of a fee. Small amounts of brush can be placed in the roll carts or bundled next to the curb for weekly pickup with yardwaste. 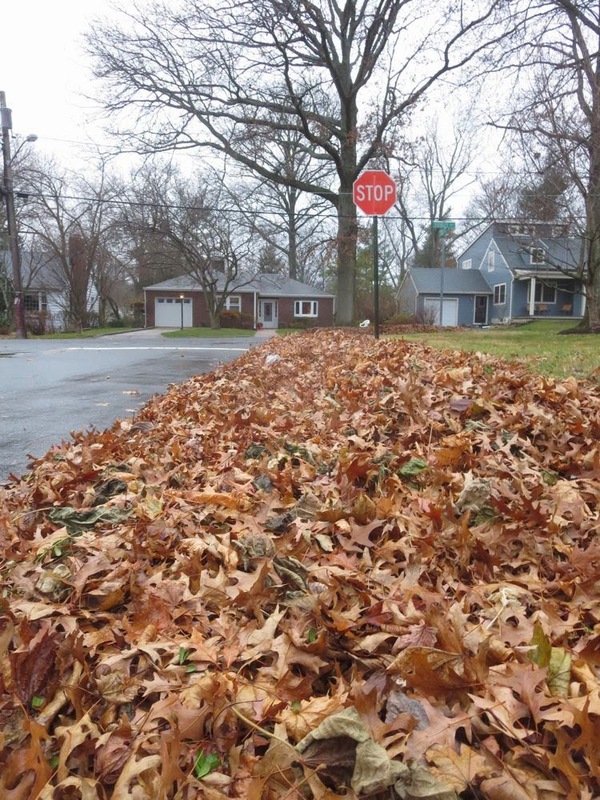 · Town-wide pickups of loose leaves and brush after big storms, if needed. · Containerized leaves/yardwaste will be collected 10-12 months/year, once per week on a given day for each neighborhood. (could possibly exclude Jan/Feb) Currently, bagged leaves are picked up 26 times per year. This proposal would nearly double that service, and make it consistently on a particular day. As with trash and recycling, containerized yardwaste/leaves would only be put on the curb the night before the collection. Though yardwaste bags can be used, a roll cart will be the primary container, as has been used in many cities. Unlike yardwaste bags, the roll cart--like our 32 gallon green foodwaste carts but larger--is easily rolled around the yard, holds 2-3 bags worth of material, is easier to fill, and keeps contents dry. It can also be emptied into the truck using a hydraulic “tipper” hook that can be retrofitted onto existing trucks for $5000/hook. The cost of roll carts for 7000 dwellings is about $400,000, to be paid either by the town or shared with participating residents. This one-time town cost would be paid back through savings within a year or two. Residents desiring additional carts could purchase them at cost. · Enforcement of the policy, combined with education as described by the PEC memorandum, will encourage people to "leave the leaves", to utilize them on the property through mulch-mowing, leaf corrals, and raking/blowing leaves into wooded areas on larger lots. Since fencing for leaf corrals is generally sold in long lengths, the town could provide the fencing and stakes to interested homeowners, who would then be expected to email back a "selfie" of them with their installed leaf corral. Residents/landscapers want simplicity and consistency: Princeton's current approach has complex schedules. Homeowners and landscapers frequently ignore these schedules and instead impose their own, simple policy, which is to dump leaves/brush year-round at any time. A simplified, consistent collection approach would imitate the successful approach we use for garbage and recycling. 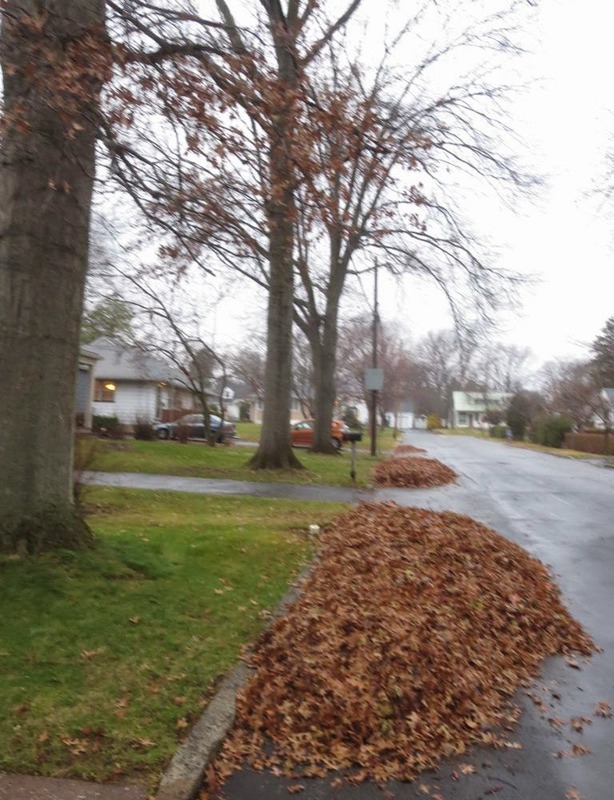 Residents imitate their neighbors: If one neighbor puts leaves out on the wrong week, others will do the same. Since backyard composting is invisible from the street, this beneficial practice cannot be spread by imitation. The town's green rollout bins (e.g. roll carts) for foodwaste are highly visible--a quality that the town has taken advantage of to encourage more people to sign up. A larger rollout bin for yardwaste would have the same advantage. Working with nature makes life easier: The roll carts, along with education and promotions like free leaf corrals, will motivate residents to discover the advantages of mulching mowers and/or piling leaves in corrals or wooded portion of their property. The PEC memorandum, which references a very helpful website, Love 'em and Leave 'em, does a good job of encouraging and informing this approach. Making the case for cost savings: Neither the loose leaf pickup nor the bagged leaf approach is efficient. The former requires a large caravan of machines; the latter means awkward stuffing for the homeowner, and cruising of town by crews to pick up widely scattered bags along the curb. Once data is available, we can give the public a sense of potential savings. The combination of education, enforcement, and the habits formed by utilizing weekly containerized pickup, will cause residents and landscapers to shift towards utilizing leaves/yardwaste onsite in the yard, and thereby further reduce the cost of composting and collection. This proposal recommends practices that have been successful in many other municipalities around the country. It provides answers for all the various forms of organics--leaves, yardwaste, brush, and even potentially foodwaste. While gaining the many fiscal, ecological, safety, and aesthetic advantages of containerized collection, the proposal adds a new weekly collection service that will be cleaner, safer, more consistent and more fair. Do Municipalities Lack Info on Best Practices? Let's say you're a town in NJ that wants advice on how best to deliver services in a cost-effective way. You'd think there's an umbrella organization out there working to provide towns with information on how best to do this. It would compile information on best practices, and make that information easily available, so that each town doesn't have to spend staff time doing its own research. If your dog is barking for no clear reason, it may be picking up on the high-pitched sound of 565 municipalities in New Jersey all trying to reinvent the wheel. One potential provider of useful information is the NJ League of Municipalities, which just had its annual conference. Since the public works directors I've spoken to in the Princeton area all express exasperation over the struggle to collect loose leaves, yardwaste and brush, I called the League to ask for information on best practices for this service. How do other towns do it? Has anyone come up with a better system? Surprisingly, the man I was directed to for an answer was completely unaware that towns are struggling with the leaf/yardwaste/brush issue. He didn't remember any articles in their monthly magazine on the subject. They have no best practices for various municipal functions, but if I wished I could look at their monthly magazines for articles. The magazines are not online, however, and the only way to search them is to go to the library and look at each year's December issue for a list of articles, then find that month's magazine in the library's stacks. Pretty retro. Surely there's some more accessible source of information that just googling with a few key words. Here in Section 1 (Princeton's divided into five sections for leaf collection), a rogue pin oak is ignoring the collection schedule. A thorough walk around the block suggests it has accomplices scattered throughout town. The schedule says the last loose leaf pickup was a month ago, and the last bagged leaf pickup was Dec. 15. But this pin oak (upper left) has held onto its leaves and is dropping them in a clearly passive aggressive, "time release" fashion that may continue into January. Since trees have rings, we can only assume that this tree is the ring leader who has prompted residents in turn to rake the leaves into the street in defiance of municipal collection schedules. The consequence for all this rogue behavior? The town will surely ignore its own collection schedule and come by once again with The Claw and its heavy-metal entourage. Wind has blown the leafie-come-lately pin oak's leaves into neighbors' yards, making the disconnect between town collection schedules and the tree's behavior a problem for multiple homeowners. What's the solution? 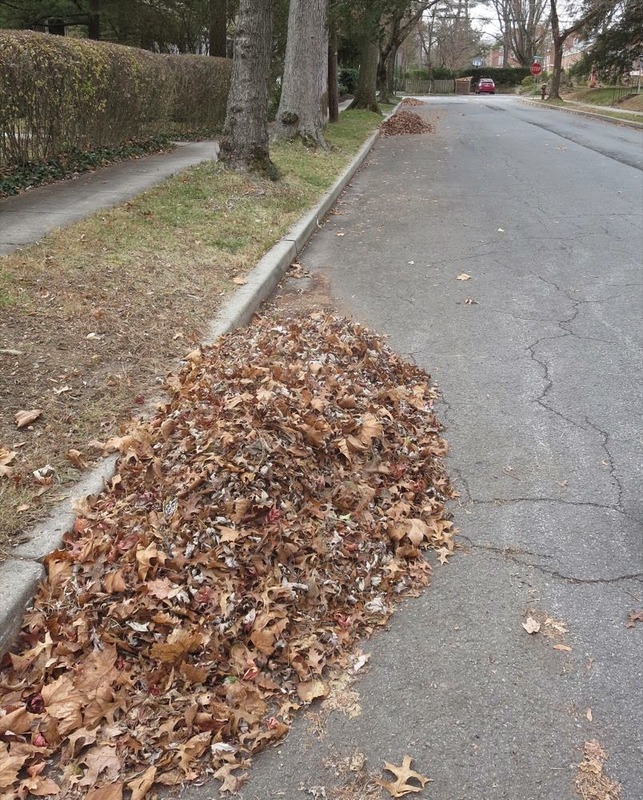 If each neighbor had a roll cart and weekly year-round collections, these neighbors could keep up with the slow drip of leaves from this and other oak trees, rolling the cart out to the curb just one day a week rather than leaving piles of leaves out on the streets for what could be weeks. Any extra beyond the cart's capacity could be put in yardwaste bags or piled in a leaf corral tucked into a corner of the yard. A large, 96 gallon roll cart would hold all the leaves in these five partially filled bags, which are now stranded at the curb because they were put out too late for the season's last pickup. The recurrent message from residents is that they need a curbside service with no stops and starts. A consistent, weekly pickup will also relieve staff of having to fashion and then revise complicated stop-and-start collection schedules. Because many people in Princeton are having trouble understanding the concept of using roll carts as part of the solution for collection of leaves and yardwaste, I offer some Q and A below, and have searched the web for videos that will demonstrate how they work. That search suggests that "roll carts" is a more common name than the term I was using in previous posts, "rollout bins". They're also called "polycarts". Just to get you in the mood, here is a mind-opening, entertaining, two minute video that captures the spirit, portraying the roll cart in heroic terms, complete with marching band. Come on, Princeton! If Enid, Oklahoma can switch to roll carts for yard waste, we can do it, too. I called Enid, and was told that the video is an accurate portrayal of the roll carts' popularity among residents. 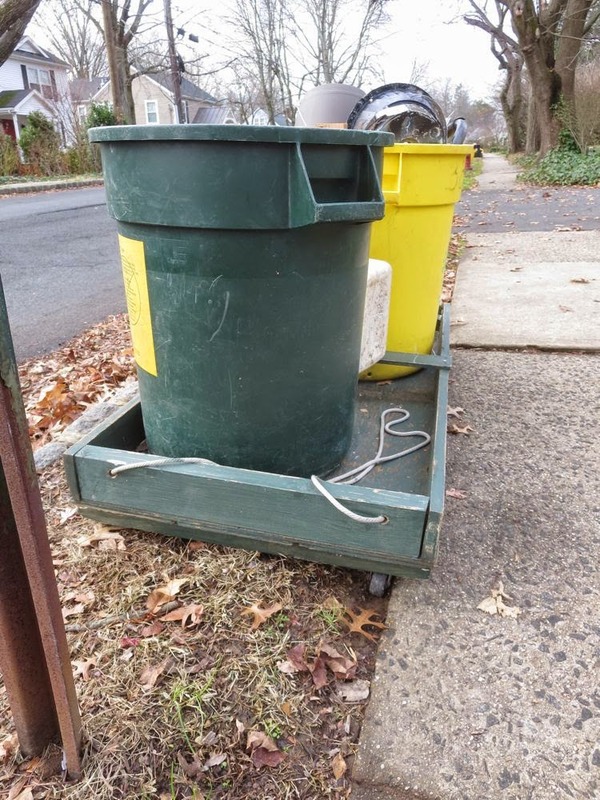 Roll carts of varying sizes are used in towns and cities across the country to hold trash, recyclables and yardwaste, and are becoming increasingly common in Princeton. Most residents in the former township used them prior to consolidation because each resident had to contract with a private hauler for trash collection, and private services find roll carts to be the most convenient and cost-effective container. Downtown merchants roll their big, 95 gallon roll carts full of recyclables out to the curb on Nassau Street each week. Food waste is collected in small, green 35 gallon roll carts. And less durable versions of roll carts are increasingly dominating the selection for homeowners at the local hardware stores. The increasing size of roll carts available at the hardware store also increases the potential for back injury among trash collectors expected to lift them. And that's where the hydraulic hook, called a "tipper", comes into play, particularly when considering using large roll carts for containerizing yardwaste year-round. The hydraulic hooks that mechanically empty the contents into the truck are mounted on the back, and operated with a lever by the crew member. Those hooks work only with the sturdier carts purchased directly by municipalities or private haulers (see photo at bottom of post). How could a roll cart possibly hold all of my leaves? In the fall, it can't, which is why I'm suggesting continuing the fall loose leaf pickup. Optimally, we'd shift to mulch mowing, leaf corrals, and blowing/raking leaves into wooded areas on larger lots, but that would require a paradigm shift in many people's thinking. The other ten months of the year, however, nearly all piles of yardwaste put out on the street could instead be neatly containerized in a roll cart and put out on the curb only on the weekly pickup day. Even in the fall, roll carts will be useful for containerizing leaves that fall gradually from trees, with a new pickup each week. Leaves are mostly fluff, so a lot can be packed into a cart. Roll carts will greatly reduce the amount of loose leaves put out on the street, and may help shift people towards seeking ways to use leaves in their yards, where they can provide great benefit to the soil, plants and wildlife. Where to stow the roll carts? Some towns offer residents different sizes of roll carts--35, 65, or 95 gallon. Even though the largest size holds the equivalent of three yardwaste bags, it isn't that big. It can be stowed in the garage, or around the side of the house, or behind a shrub. People can stick with yardwaste bags if they want, but once they find out how much more convenient carts are than yardwaste bags, they will suddenly find they have room for them after all. Won't they be too heavy for crews to empty into the truck? Princeton's existing trucks can be retrofitted with a rear load "tipper"--essentially a small hydraulic hook that will lift the cart up and dump its contents into the truck in one quick motion. My phone calls to multiple suppliers suggest a cost of about $5000 per hook. Here's the shortest video I could find, running thirty seconds, demonstrating the "tipper". In fact, it's the yardwaste bags that pose a hazard to crews, since wet leaves can make yardwaste bags very heavy, and they must be dragged to the curb by the resident, then lifted by the crew without hydraulic assist. What if I can't get all of my yardwaste into the cart? Yardwaste bags can still be used for extra leaves/yardwaste. Or, you can stow some yardwaste in a temporary pile behind some shrubs until the next week, or make a small corral for extra leaves in some out of the way spot in the yard. The consistency of weekly pickups will provide homeowners with certainty, so they can adjust their yardwork to best take advantage of the service. Won't the carts be too expensive? There are two routes to go. One involves buying a fancy truck that requires only one crew member, and automatically grabs and empties the cart. These are expensive, and would seem to be impractical in the former borough, with its parked cars blocking a truck's access to the curb. And these automated trucks would preclude any use of yardwaste bags. The other approach involves a $5000 retrofit for existing trucks, and about $420,000 to buy the carts for 7000 households (at $50 each). The town could provide the carts for free, or share the cost with those households who want the service. Even if the town distributes carts for free, this one time investment would pay for itself in a year or two. Residents could purchase extra carts at cost if desired. Roll carts are plastic. Don't we want to avoid buying additional plastic? Our containers for trash and recycling are also plastic. Some roll carts are made of recycled plastic. A large roll cart filled and emptied fifty times per year avoids the consumption of 150 single use yardwaste bags. That's a lot of paper saved over the lifetime of a roll cart. How about brush? Residents would be given 2-3 free special pickups of brush each year. Small sticks/branches that occasionally fall in the yard could be cut to size and put in the roll cart for the next weekly pickup. Some municipalities using roll carts for yardwaste include San Francisco, Portland, OR, Seattle, Ann Arbor, MI, and of course Enid, Oklahoma (Don't tell me you didn't watch their awesome video!). In all the cities/towns mentioned above except Enid, they've taken the extra step of allowing foodwaste to be added to the yardwaste cart. In Ann Arbor, this mixture is composted in windrows outside of town just like normal yardwaste. This potential future step for Princeton, which would mean big savings in landfill tipping fees, is only possible if we start using roll carts for yardwaste. There have been some calls to end looseleaf collection altogether, even in the fall. I think the perception of leaves as something to purge from the yard is too widespread and deeply engrained for Princeton to adopt such a policy. A case can also be made that the planting of trees along public right of ways obligates the municipality to provide some collection service to deal with the resulting leaves. 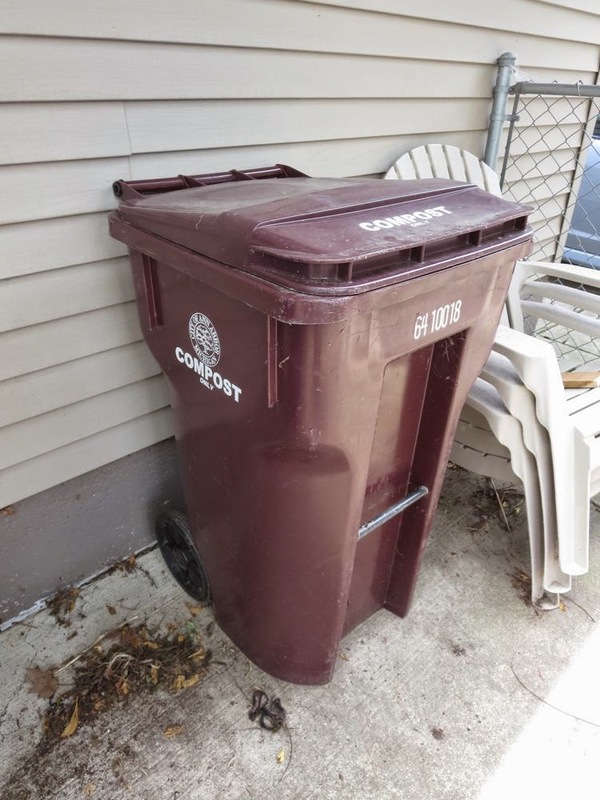 For those interested in ending loose leaf pickup in the future, however, it's interesting how weekly collection of containerized yardwaste in rollcarts (+ yardwaste bags if desired) has made such a policy shift possible in Ann Arbor, MI, providing increased safety, predictability and fairness, as explained on their website. Montgomery, just to the north, offers no curbside pickup--neither containerized nor loose--of leaves/yardwaste. Whether that means homeowners keep leaves on their property, or have landscape services haul them away is not clear. Some of those leaves are reportedly brought to Princeton by landscape firms to dump on our streets. This Saturday, Dec. 13, Princeton Future will offer preliminary results of its effort to compile a community database called Princeton Profile 2014, at the Princeton Public Library, starting at 9:30am. Having gotten a good numerical feel for Princeton in the morning, you can then take your numerical and spiritual value any number of directions, such as the 2pm march in New York. Wherever we go, we each have the considerable numerical power of one, with spirit either augmenting or subtracting from that. The database's alliterative title, in the tradition of Planet Princeton, Princeton Packet, our own Princeton Primer, and the more-alliterative-than-thou Princeton Printers, should help Princeton Profile survive to become an annual event. I was involved in an early effort to quantify various aspects of Princeton's environment, including the built environment, when the Princeton Environmental Commission worked with a consultant to update the Princeton Environmental Resource Inventory (ERI) in 2010. It has all sorts of maps and tables and descriptions that offer a portrait of Princeton. But that's essentially a static document. An annual Princeton Profile could take the ERI as a starting point and build on it, build awareness and maintain relevance. I emailed Princeton Future to ask them to include numbers on Princeton's Sisyphean struggle to prevent streets from disappearing under the masses of leaves, yardwaste and brush continually heaped upon them. Numbers, such as annual expense, will inform and motivate a change in policy, and there's no other change in policy that offers the same potential for both saving money and improving service and town appearance. One estimate I got from a now-departed public works employee was that collection and composting costs $800,000/yr, half of which he said could be saved with a more efficient policy. My guess is that the cost is $1-2 million when all the direct and indirect costs are factored in. Let's say we adopt a new approach to collection, with rollout bins as the core, year-round service. Weekly pickups would be augmented by two months of fall looseleaf pickup and two or three special pickups of brush that each resident could call in to request. And let's say that Princeton has about 7000 houses and duplexes (page 113 of the ERI). That means the use of rollout bins for yardwaste, with weekly pickups like we do for trash, could provide the same service as 16-24,000 yardwaste bags per year. Those numbers might help people see that the one-time purchase of durable containers made of recycled plastic would not only reduce the need for the gas-guzzling, crew-intensive Claw caravans but also greatly reduce consumption of paper. 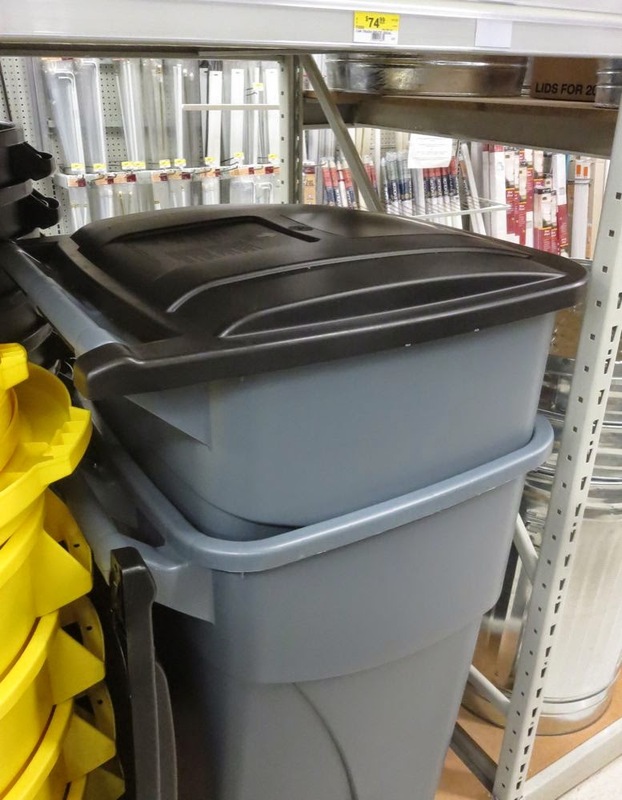 How to pay for new rollout bins for homeowners? Well, Princeton provides free rollout bins for participants in the foodwaste collections. I've heard quotes of $50-60 for the larger sized bin needed for yardwaste. With some 7000 homes, that comes out to about $400,000--a one-time expense that could be borne by the town or shared with the participating homeowners. We'd likely save that much money in the first year. Adding a small hydraulic hook on the backs of existing trucks would cost another $5000/truck. When combined with education encouraging homeowners with wooded lots to put their leaves in the woods rather than on the streets, the new program will also reduce costs at the composting facilities. Decisions are only as good as the numbers they're based on, and all too often people use inaccurate numbers to discredit good ideas. We'll see if Princeton Future's effort, refined over time, can help inform local decision-making. Though we're still waiting on numbers, it's likely that Princeton spends over a million dollars per year cleaning up and composting the vegetation people throw in the streets. The problem has increased since consolidation, as the traditionally intense collection of loose leaves, yardwaste and brush in the borough has spread to the township. As more and more public works staff are sent chasing after these endless dumpings, more of the town's work either gets neglected or contracted out at additional expense. could each fit easily in a large yardwaste bin (like the green foodwaste bins but larger). If each participating resident had a yardwaste bin, this street would be clean, with bins rolled out to the curb just one day a week for collection. The street would also be clean during spring and summer months when people could be containerizing their small amounts of yardwaste rather than putting them loose on the street. We containerize our trash, our recyclables, and our sewage. And we can easily containerize the great majority of yardwaste generated year-round. Here's another example--busy Wiggins Street, leaves sopping wet, the cars spreading the leaves a block in either direction on their tires. A big, soggy mess, bleeding nutrients into local streams, speeding the eutrophication of Carnegie Lake. And very little room on the narrow street for any piling of leaves. Far better for these leaves to have been stuffed in a yardwaste bin that could be rolled out to the curb once a week for pickup. Another example, on Stanley. Most or all of these leaves could have been ground up by a mulching mower and either left on the lawn or used as mulch. Any extra could be put in the yardwaste bin, so we don't need to look at or drive around this illegally large pile for two weeks. Tremendous increases in efficiency will be gained when this caravan of four vehicles (two garbage trucks, the "Claw", and the pickup truck way in the back that accompanies them for safety on busy streets) is reduced to one vehicle with two personnel--one to drive, and one to roll the yardwaste bins to a lifting hook fitted on the back of the truck. It's been done to good effect in other cities, and our streets and budget are begging for a similar fix in Princeton. Digging through old Princeton newspapers (online) for info about Oswald Veblen, I found this from October 7, 1976. Thirty eight years and an extra 67 ppm of CO2 later, Jimmy Carter will speak at 2pm tomorrow, Wednesday, Dec. 3, at the Princeton University Chapel. 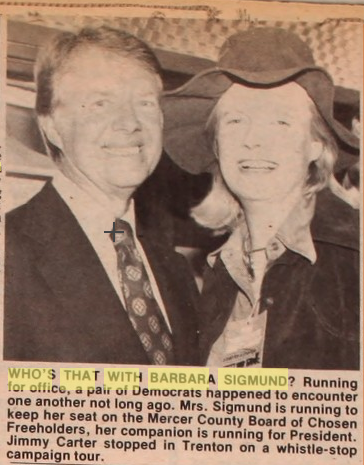 Barbara Boggs Sigmund was, among other things, mayor of Princeton from 1983-1990. Her sister, Cokie Roberts, is officially Mary Martha Corinne Morrison Claiborne Roberts (née Boggs), which suggests that Barbara had some more names in there. While we're at it, I'll mention that the Barbara Sigmund memorial garden is located at Chestnut and Hamilton Ave, and is in need of a knowledgeable caretaker. People tend to accept the status quo without thinking much about how things could be better. Broken glass in the sidewalk? Nine out of ten people would step around it and be on their way. Maybe ninety nine out of a hundred. I've seen this phenomenon when a fallen branch blocks a sidewalk near an elementary school. Rather than simply pick the branch up and move it out of the way, parents and kids would walk around it, day after day. The thought somehow doesn't enter the mind that a thirty second intervention would benefit everyone who follows. When entering a building, however, people feel good about holding the door open for the person coming behind, but that instinct doesn't translate to town streets and sidewalks, where the public space is somebody else's problem. But actually, Princeton uses the county recycling program, so any change would involve either pulling out of the county program, or getting the county to update their approach. Meanwhile, as we carry today into an indefinite string of tomorrows, our psyches are well-armed to tolerate small, repetitive annoyances, and our shoes will protect us from broken glass.